Just three days before the 2016 Bluemont Fair (third weekend in September), Epling Landscaping generously and professionally installed a handsome, new, permanent interpretive sign on the front lawn of the Snickersville Academy. The illustrated DuraReader sign, purchased from EnviroSigns of Wooster, Ohio, sketches in all the basic elements of the story of this 191-year-old landmark. Those familiar withjBluemont may notice that the sign bears a family resemblance to the already-standing EnviroSign at the Bluemont Station Mill and Tower on Railroad Street. 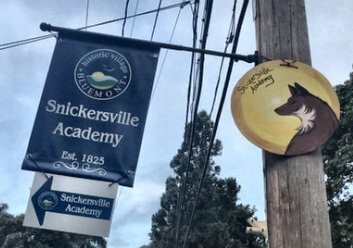 The new way-finding sign tells the "Lives and Times of the Snickersville Academy"-- from its beginnings as Snickersville's first schoolhouse and church (1825), to its continued use as a school through the Civil War (1861-1865), to its brief career as a public school (1870-1872), to modification for use as private rental housing around the turn of the century, to four decades of being the family home of Susie Neal and her children, grandchildren, and young great grandchildren (early 1940s-early 1970s), to the restoration of the log structure by Friends of Bluemont (2010-2016). The Academy's first public use in more than a century comes in mid-October, as the Bluemont Fair Committee chooses to hold its 2016 "wrap-up" session at the Snickersville Academy. After that, Friends of Bluemont will whitewash the building to create period authenticity and to seal the log and chinking walls. Below: The restored Snickersville Academy set up for community meetings. 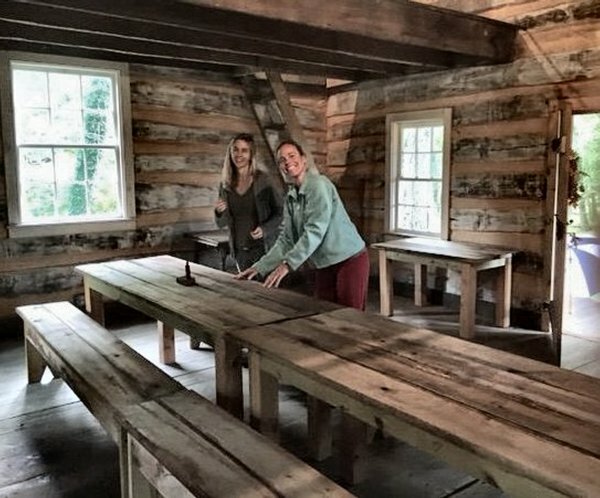 On right: 2016 Bluemont Fair co-chairs Cynthia Morris and Jen Stone arrange the school furniture--benches and tables newly fashioned of antique wood. 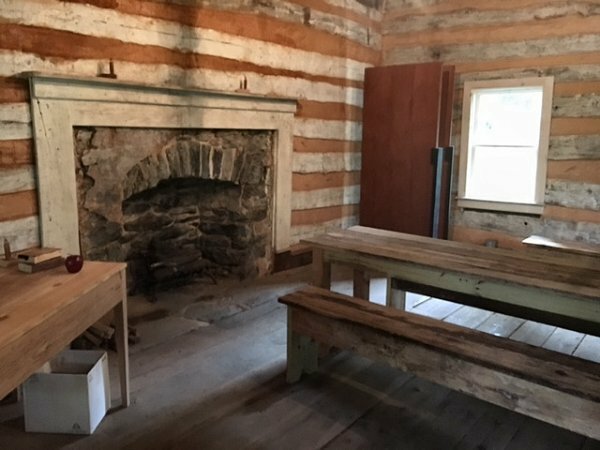 Left corner: replica period teacher's desk made by Mark Zalewski, Friends of Bluemont's vice president in charge of restoration. 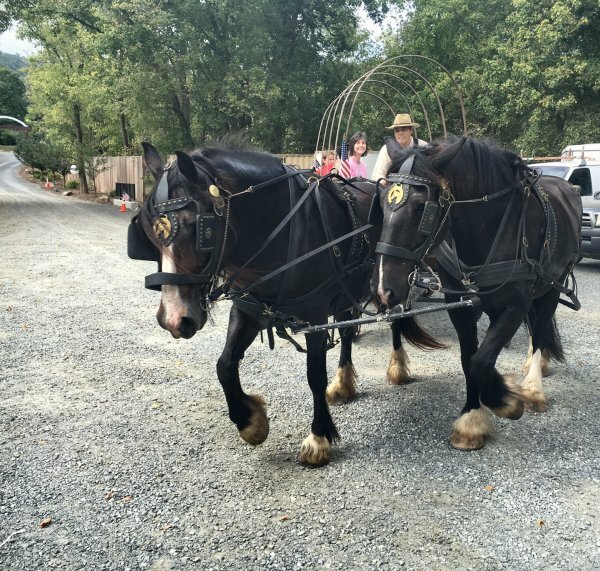 Nolan Barzee of Mr. Print in Purcellville provided horse-drawn wagon rides from the rear of Epling Landscaping into the Boulder Crest property, recalling the times when the village roads were for horses and foot-traffic only. 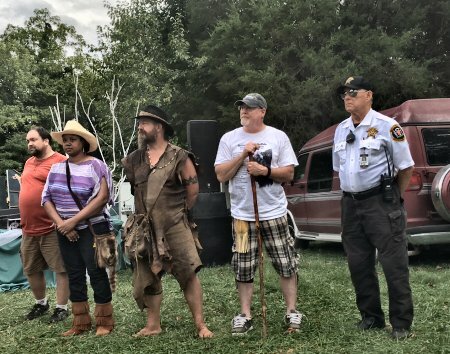 The Indian Village--a joint project of the Sanctuary on the Trail and the Bluemont Montessori School--erected a teepee and a wigwam as well as offering crafts and presenting demonstrations of Indian dancing. There was a special dance honoring military, Veterans, and uniformed services (below, right). 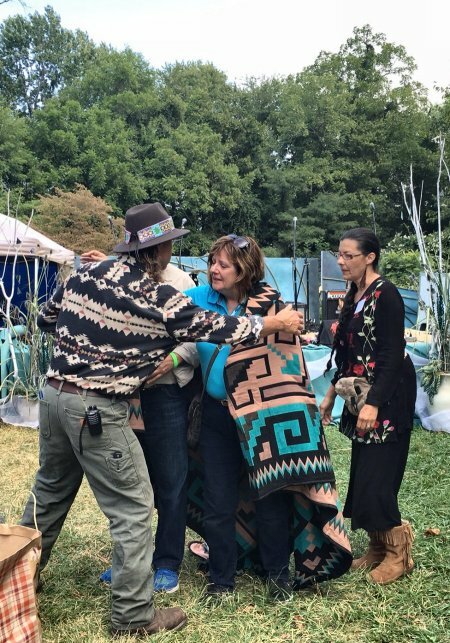 Chris and Rene White honored Ken and Julia Falke, founders of Boulder Crest Retreat, by ceremonially wrapping them in a blanket (below, left). Also at this year's Bluemont Fair and throughout the village: the bright blue banners with the names and dates of Bluemont's historic buildings. The banners--designed, produced, and hung by George and Natalie Evancheck of Friends of Bluemont--will remain through the Blue Ridge autumn leaf season. 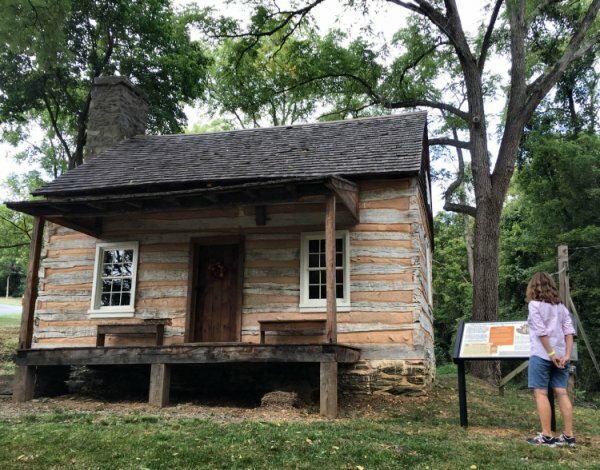 Friends of Bluemont's palm-card-sized walking tour maps of the village will be available at the post office, the Bluemont Community Center, and the Bluemont General Store. Remember, these cards have a "square" which, using your smart phone, takes you to more information about our historic places through the web. Some new ideas about next year's Bluemont Fair are already bubbling up. In particular, people are talking about how to weave more elements of re-enactment into the annual fair. Strolling impersonators of national and local historical personages? Take your picture with George Washington? Or Colonel Mosby? Skits about the lives of children who went to school at the Snickersville Academy? 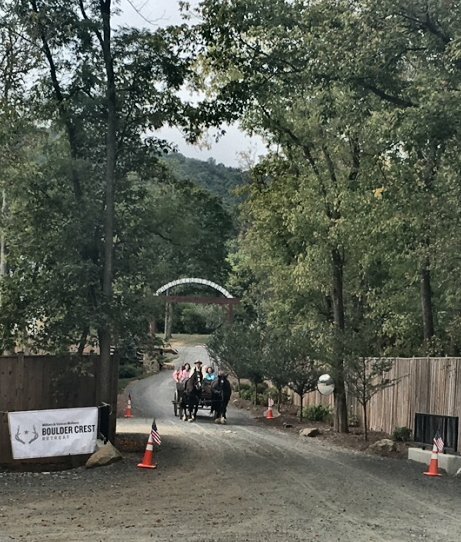 More and better wagon rides into Boulder Crest?